The “Main Cliff” at Waipapa is tucked away out of sight in a valley about 1km down stream of the Waipapa dam. It was first discovered by Kevin Barratt in 1999. Kevin returned to the crag a number of times that year and put up the first couple of routes, “Finger of Fate” and “Side Winder”. This gem of a crag soon attracted a lot of interest and over the next 2 to 3 years a number of climbers from Hamilton, Auckland, Rotorua and Wharepapa put up near on sixty routes. The rock is a very compact fully welded Ignibrite with small edges lower down and pocketed nearer the top. The routes here require a totally different climbing style compared to their Ignibrite cousins down the road. The small holds and edges require balance and finesse as opposed to power and brute strength. The Main Cliff faces North and is situated on the side of a bush covered gully, with native trees right along the base and pine trees at the top. Access to the top of the cliff is difficult so all the routes have belay stations at or near the top of the cliff and descent is by abseil. There is a mix of sport climbs and trad climbing with some routes having a bit of both. The first person to do any climbing around the Waipapa dam was Graeme Dingle, Corrina Gage and Andrew Cory in 1981. Graeme and Co paddle across the lake and put up 2 climbs on one of the small outcrops along side the lake directly opposite the road. These routes were forgotten about until the CNI guide was published. A few climbers started to develop some of the cliffs up above the road but despite it’s appearance the rock here tends to be soft and friable and as a result there has been no further development in this area . There are numerous other account of people looking around the cliffs along side the powerhouse and immediately down stream of the dam but prior to Kevin Barratt discovering the main cliff there are no records of anyone doing any routes. There is absolutely no Climbing on any of the cliffs in and around the power house or carpark. To ensure continued access to the other cliffs in the area please do not climb on any of the cliffs in the car park area. The NZAC is currently in negotiations with Mighty River Power over access to Lakeside Wall and Crack Wall. While these negotiations are in progress the Lakeside and Cracks walls are closed for climbing. 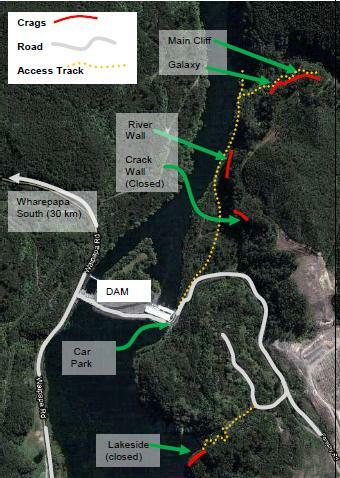 The Waipapa Dam is located on the Waikato River right along side of the Wharepapa to Mangakino Road (Waipapa Rd). The Waipapa Dam is about 30 km south of “Wharepapa South” and 15 km North of Mangakino. Once at Waipapa drive across the dam and park in the car park on the opposite side of the powerhouse. The main climbing area is about 1 km down river from the dam. From the car park climb the gate and follow the sealed road for about 200m before veering off left down a metal road. Follow this road taking a right at the first fork in the road. Just past this point on your right is the Crack Wall area. To get to the Main Cliff continue down the road/track veering right at the 2nd fork then down this road till you reach the river and a steel water pipe. The cliffs in this area are referred to as “The Pipe Line Wall” and sport a number of fine lines. Follow the pipeline down river till you reach a stream. This means you’ve gone to far. Backtrack 10 metres then take the track marked by a couple of poles. This leads up through the bush cross a large slip then up a series of steps to the crag. The track meets the Main Cliff at the Galaxy wall area near “Hand Christian”. For the Main Cliff continue along the track tht leads along the base of the cliff to the fare left end.